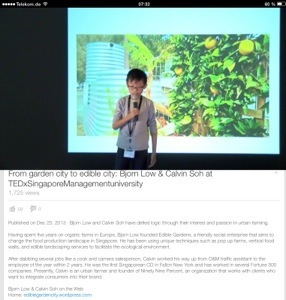 Video of the month: urban farming in Singapore – Go India, go future! I like it. The urban farms you see when visiting huge cities such as New York, Berlin or Singapore. These surprising green small parts between huge streets and skyscrapers, the green fields of herbs and vegetables, even rice and a huge number of different fruits where you never ever expect them to see grow. It is always worth talking to people who take care. You can learn so much about how they live and their way on how to change the world. It makes you feel a little bit closer to the origins of your life in an artificial world of lights and plastics. Thanks to all green urban farmers! Thanks for the idea of making cities sustainable. Previous Post Which story does your enterprise tell to fight the witch?